I have talked about the future and that it is changeable, but I wanted to expand on that here in this article. What you are living now is the result of your choices, (both consciously and unconsciously) and mental programming. The partner you're with, the career you're in, the health you enjoy or don't enjoy are all a reflection of you. This is because life is a series of choices, and the choices we make today, lead to a different outcome of the now state (since technically, there is no tomorrow, just the ever present now state). I am fortunate enough to have witnessed through dreams how this works. Often I see my "future" through dreams, and because of that I can make choices 'now' that changed those dreams! Now, while many people can't recall or interpret their dreams with ease, there are other ways of seeing what your future will be, based on your current attitudes and choices. For me, I use the tarot deck (for both myself and close friends). The results are really impressive! And you don't need any special education to use them. They are available at any book store and are affordable for most. 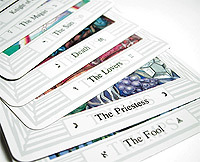 Ịf they don't come with a book, pick one up as you'll need help selecting the spread (I use the Celtic spread) and interpretation of the cards you select. When I do a card reading, I handle the cards for several minutes before spreading them out (like a dealer does at a casino) and upside down. I get into a reflective state (alpha) and concentrate on what it is I want to know (romance, a special issue, career, whatever my question is for me or the person I'm doing the spread for). Then, I slowly move my hands over the deck and wait for an energy to be felt. When I feel that small tingle or "pulling" sensation I turn the card over and place it in the appropriate position as the Celtic spread outlines. Then I do my translation. Now, while there are beginner type readings that you can do using the book, down the road if you enjoy this like I do, you'll want to incorporate more advanced readings such as reviewing the percentage of symbols (pentacles versus swords for example), reflecting on major and minor arcana influences (are there a lot of powerful major arcana cards? what is the influence of the male and female energies? ), knowing the astrological counterparts, etc. I have never been anything but amazed at the results of my readings. They have helped me and others look at themselves and their probable future at which time they are free to make selective choices which will in turn result in a different reading down the road! I just did a reading for a friend of mine and it was nearly identical to what he is living now. He's broke, making incredibly poor financial choices, has no assets, and not a penny saved for retirement (and he's in his late 40's). The cards stated that he was heading for financial ruin if he didn't drastically change his present course! After I gave him his reading (generally these are about five type-written pages) he was left with some choices to make. The cards basically showed him something he wasn't comfortable looking at. His response was that he doubted he could change his lifestyle because he enjoyed spending money too much and loved the "good life." This is his choice!